Third Place goes to the world of Islam for this headline: Islamic Cleric Bans Women From Handling Bananas, Cucumbers & Other Phallic Produce. A Muslim cleric living in Europe made this declaration to help women, "avoid sexual thoughts." He is not without compassion, however. If a woman wants to eat a banana, carrot, or a cucumber, a male relative, such as a father or husband can cut them up for her and serve them in small pieces to protect her from temptation. I'd love to hear that conversation! And these people want the rest of the world to take them seriously? Second Place goes possibly the most expensive car wreck ever. 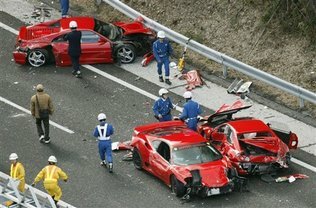 It took place in Japan: Fleet of Ferraris Ruined in Sports Car Freeway Pileup in Japan. I know people make jokes about Asian drivers but I'm sure this was just a simple accident that happened to destroy 8 Ferraris, 2 Mercedes, and a Lamborghini. The total for this little fender bender is about 1 million dollars. I would never want to feed the stereotype about Asian drivers but there is an unconfirmed report that the driver who caused the wreck was trying to take a picture when the wreck occured. 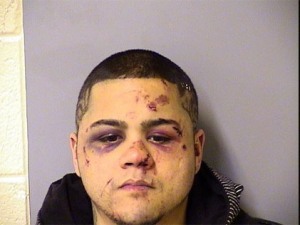 And this weeks Number One Story is: Robbing Ultimate Fighting Expert Proves To Be Bad Decision. This story just makes me smile. It seems that Anthony, pictured at the right, picked the wrong guy to try and rob. Anthony walked up to the victim, who was sitting in his car. Like any good robber, Anthony pulled out his pistol and demanded the driver's money. The driver complied and gave him some money. Anthony should have stopped while he was ahead. Instead, he rolled the dice and went for broke. Anthony ordered the driver out of the car. This was a bad idea. Before Anthony could steal the car, the "victim," a mixed martial artist, grabbed Anthony and his gun and wrestled him to the ground. The pistol discharged striking Anthony in the ankle. As you can see from Anthony's book-in photo, the MMA guy also used his face as a punching bag. Anthony was already a convicted felon but at least this time, he will have a great story to tell the guys on his cell block.